How many times do we need to talk about a minimum wage hike? How many different angles do we need to come at it? 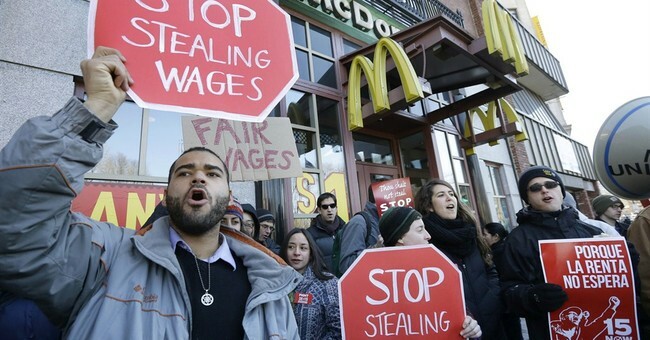 A minimum wage increase would severely hurt the economy. More and more interesting reports keep coming out showing all the reasons why a minimum wage hike could hurt the U.S., but President Obama keeps touring the nation telling people how much we need it! A new survey of 1,213 business owners found that unemployment would increase as would prices of goods and services. 54% said they would reduce hiring and 65% said they would be increasing the prices of their good or service. Additionally, the survey found that 38% of those employers would lay off workers if they had to follow a minimum wage increase. 213 of the survey’s respondents currently pay their employees minimum wage. Clearly President Obama is not thinking this through. Study after study keeps finding that this minimum wage hike would severely damage our unemployment rates. And there are more and more examples of employers saying they will find another way to make their products or provide their services with fewer employees if the minimum wage is increased.